We often work with branding and marketing companies to assist their clients with their signage needs. This is the case with Pinnacle Bank. In May of 2017, we helped them brand their new location with a variety of signage. Pinnacle Bank is a community bank founded in 1934. They have locations throughout Northeast Georgia. While they are a small bank, they have been able to thrive throughout the turmoil of the past 80+ years. What makes Pinnacle Bank unique is how they operate. They don’t do risky investments like other banks, opting for a more conservative approach. They have continued to create new loans to qualified borrowers without needing to accept any government assistance and without participating in the Capital Assistance Program. And they always put customer service and creating exceptional customer experiences first. Their conservative approach means that they are not quick to expand, creating numerous branches. Instead, they take a measured approach to expansion to ensure that they do not overstretch their recourses. Their new location in west Athens makes them conveniently located next to key shopping and grocery centers. When it comes to branding your location, it’s important to have a consistent message and style. At the new location, we installed several wall graphics and canvas prints that highlighted the company’s mission and values with wording and images. Additional signage was installed to promote the services that the bank provided. At the teller pods, vinyl graphics were installed to highlight key aspects of the business, such as “totally free checking”, “Totally Free Business Bankings”, and “The Bank That’s Built To Last”. The most impressive sign was the logo sign for Pinnacle Bank. This sign used a combination of PVC, stained wood, and brushed aluminum veneer PVC lettering to create a unique sign that really stands out from the rest. 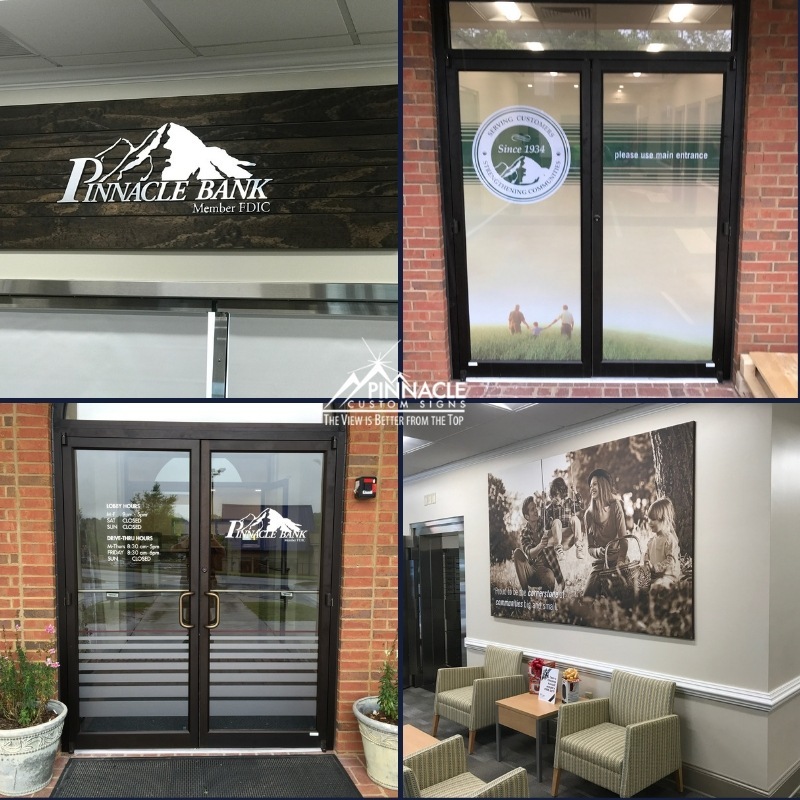 Outside the building, we installed window graphics and door graphics to provide privacy for the interior of the building and to direct individual on where to go and inform them about key information – such as the business’ hours. Over their drive-through area, we hung custom banners that advertised services provided by the business. They decided to go with removable banners to make it easier to change them out depending on what they wanted to promote. 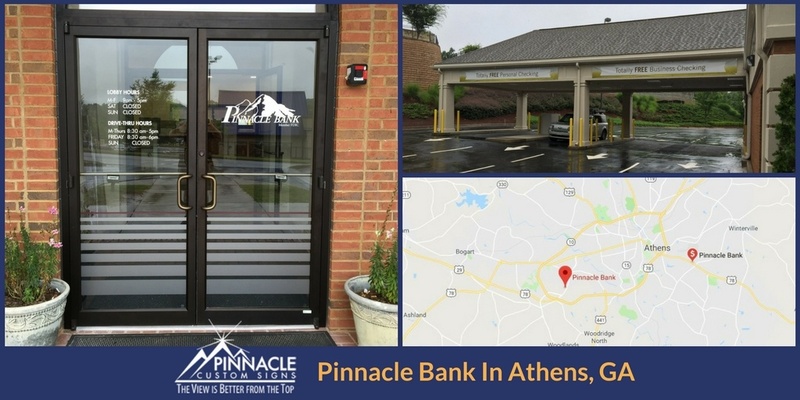 Pinnacle Bank understands the value of a good investment, both with their customer’s investments, with their branding, and with their choice of location. Their move to 1081 Parkway Blvd allows them to get right in the center of where their customer base spends their time. Their decision to work with Mighty 8th Mediea and with us allows them to ensure accurate branding and quality signage no matter where they are in North Georgia. Looking for a sign company? Come visit us!